Picking the right camping destination can make or break the perfect trip. Summer is officially on its way and in Washington that can only mean one thing: time to camp! But the bounty of the outdoors here in the Evergreen State means that sometimes just choosing a camping destination can be an overwhelming experience. Kallee Vickers, Online Marketing Strategist at Northwest Motorsport, knows that the same way you want to pick the right vehicle for your favorite activities, picking the right camping destination can make or break the perfect trip. “Taking the whole family camping and being sure that everyone will enjoy themselves is quite the endeavor,” says Vickers. At Offut Lake Resort, in Tenino (about 15 minutes south of Olympia), you have the option of booking a tent or RV site or a cottage rental if not every member of the family enjoys sleeping under the stars. With the location right on the lake, your family will be able to relax and enjoy whatever water activity they most enjoy, whether that’s swimming, fishing, boating or all three. If you have little ones in tow, Lattin’s Cider Mill & Farm is right up the road. “And with a petting zoo, amazing doughnuts and no entrance fee – there’s a little something for everyone!” says Vickers. 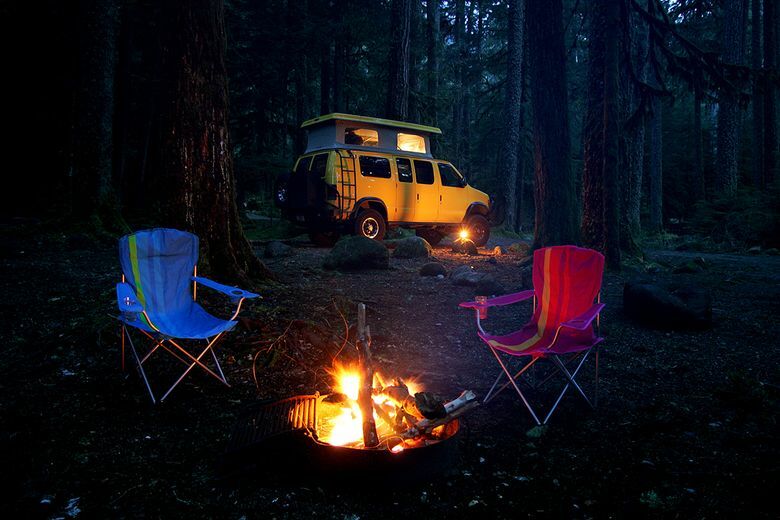 Tahuya State Forest, located about an hour from Seattle near the headwaters of Hood Canal, offers up 23,000 acres of land and about 84 miles of trails, making this a popular destination for campers who also want to enjoy some off-roading. Head to the Elfendahl Pass Staging Area for the main trail access point for motorized recreationists or the 4×4 Trailhead, the only exclusively 4×4-designated trailhead in Tahuya, boasting seven miles of 4×4 fun. The trails are considered beginner-friendly and several primitive campgrounds are available in the area to extend your off-roading adventure. “At Tahuya, you just have to load down your truck with all of your off-roading toys, pick a spot, and enjoy a fun-filled weekend of awesome camping and wheelin’.” says Vickers. For the camper who prefers to catch his or her own dinner, check out Cooper Lake, about 100 miles east of Seattle, in the Okanogan-Wenatchee National Forest. The lake is open for fishing year-round and stocked annually with trout in May and June. You can access the lake from a Forest Service road and even spend the night at a small U.S. Forest service campground. “We love it here because all motors are prohibited so all you need is to throw your fishing pole in your truck and slay some fish,” says Vickers. If you’re the type who thinks camping and hiking go hand-in-hand then check out Pratt Lake in the Snoqualmie National Forest for a backpacking trip. To make it all the way to Pratt Lake’s campgrounds, you’ll hike in through 5.5 miles of switchbacks that take you up in elevation in the first half and back down in the second half when you climb down to the lake and the surrounding campgrounds. If the weather is nice, you’ll be treated to some stellar views of Mount Rainier, glassy lakes and huckleberry picking. For those who prefer to camp on wheels, take your RV for a spin out to the Olympic Peninsula’s South Beach Campground, 38 miles south of Forks, on a bluff overlooking the Pacific Ocean. The 50 sites are available on a first-come-first-serve basis only, so get here early on summer weekends. Vickers says it’s the perfect place to enjoy the raw beauty of the Peninsula. “While there are no luxury accommodations such as heated pools, tennis courts or hot showers, the view makes it all worth it,” she says. We have had thousands of happy customers visit Northwest Motorsport. With locations all over Washington state right now you’re bound to have a Northwest Motorsport nearby. Visit to find a location near you!